I've never seen John Herbert's notorious jailhouse play -- or the 1971 film adaptation -- but these photos tell me Sal Mineo's staging with Don Johnson circa 1969 is definitely the version I'd like to have experienced. 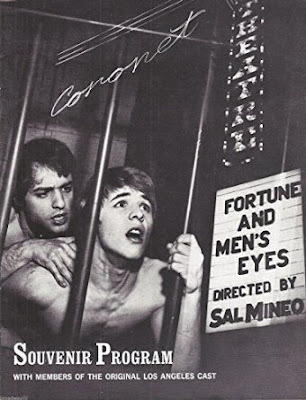 "Fortune and Men's Eyes" is a 1967 play and 1971 film written by John Herbert about a young man's experience in prison, exploring themes of homosexuality and sexual slavery. The play was inspired in part by Herbert's own experience; he spent four months imprisoned in a youth reformatory after having been convicted of wearing drag in 1947. The character of Queenie in the play is an authorial self-insertion. In 1967 the play, produced by Rothenberg, premiered off-Broadway at the Actors Playhouse from 23 February 1967 to January 1968. Reviews were initially mixed, and many reviewers were shocked by the subject matter. The play toured to Chicago, San Francisco and Montreal and ran for fifteen weeks at the Central Library Theatre in Toronto. 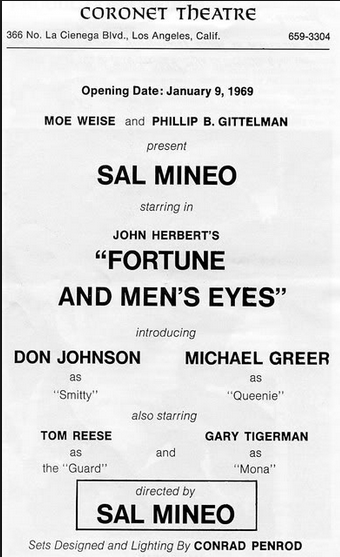 In 1969 the play was produced and directed by Sal Mineo at the Coronet Theatre in Los Angeles. Don Johnson played the lead role of Smitty, a young man sentenced to six months in prison for marijuana possession, who eventually becomes the sexual subordinate of another inmate, Rocky. Michael Greer played the role of Queenie, Smitty's cellmate. This production garnered more critical approval. 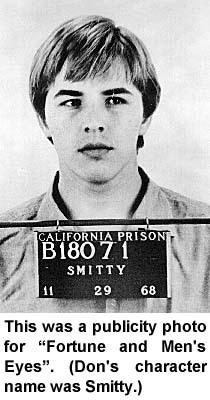 The young, naive Smitty is sent to prison for six months; Cathy, his girlfriend, watches as he disappears behind the bars and barbed wire. He's assigned a cell with Queenie, a balls-out drag queen, Then there's Rocky, a quiet but cocky con, and Mona, a young gay man who ministers to Rocky. Smitty watches in horror as gangs of inmates brutalize prisoners who lack protection. Those who complain risk beatings or murder at the hands of unsympathetic guards: all cries are bootless. Mona offers poetry -- Shakespeare's sonnet 29; Queenie and Rocky offer Smitty advice; and Rocky offers protection -- for a price. Smitty's choices and their consequences are the film's main subjects. I worked with an actress in New York City who dated Don Johnson before the run of this play. She told me that she and Don broke up because during the run of the play Don was briefly Sal Mineo's lover. She seemed like she was telling the truth. Don certainly was hot then. Sal too. I saw this play at the Coronet Theater in 1969. At the time I managed an IHOP just up the street from the theater and every night after the theater closed, Sal Mineo and Don Johnson along with some of the other members of the group would come in for a late night dinner or early breakfast. Johnson was very "playful" with Mineo when they were at the table. Oh my, this is totally new to me. Shocking, kinda! I watched Nash Beidges back in the day... Never imagined this. That's how you get big in Hollywood, it's full of sabbatean frankists that prey on others, they run the town, they are into the occult, they are evil.